It’s day 3 of a 4 day weekend here at Carole Knits. Yesterday we drove Hannah, Jessica and Patrick to the airport in New Hampshire so that they could fly to Florida to be with Brant, Heather and Ambrynn. All reports are that they are having a great time. Hannah in particular is loving the warm weather. She must get that from me. After leaving the airport we headed into downtown Portsmouth to meet up with Cheryl for lunch. I had the world’s largest Bloody Mary. Yes, that is a sawed off Grey Goose Vodka bottle. Please note the inclusion of the beer glass for scale. Let me just say: yummmm. My sandwich was good too but really, the Monster Mary was the star of my lunch. Dale and I will be enjoying having the house to ourselves for the next few days. I’ll check in again tomorrow but in the meantime, be well. Have fun with your time off! We have the week off and are looking forward to a break, too. I really really really want a glass made out of a sawed-off Grey Goose bottle. Really. Yum! Enjoy your quiet time! Yummy, I love a good Bloody Mary. Haven’t had one in ages, though. But was there a whole lot of vodka in there too? Or just more ice and juice? It looks pretty good to me this morning! All I can say is – Whoa Nellie! That looks delicious! Now I am going to be craving a Bloody Mary all day. That bloody Mary made me laugh out loud. I think I need one of those…right NOW. Holy moley! I’m looking forward to sharing a few with both of you in a few days!! Me too, one Grey Goose Bloody Mary please! 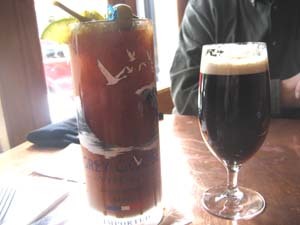 mmmm….grey goose….that bloody mary is a meal in itself. Love the monster Mary! And enjoy the peace and quiet (late Valentine’s Day gift?). Ah, no wonder no post when I got up this morning 😉 Enjoy! Holy Toledo that bloody mary is HUGE!! I think every restaurant/bar should make them that size. Before I read the next sentence I was thinking, “is that…?” and it was. Holy monster of a drink, Batman! I hope that you have enjoyed the quiet at your house – and that you slept in, read a bit, knit a bit and generally relaxed.